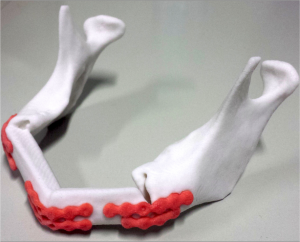 3D4MED – 3D Printing for Surgery: A new technology for an effective and customized surgery! 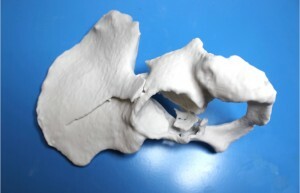 Our Services » 3D4MED – 3D Printing for Surgery: A new technology for an effective and customized surgery! 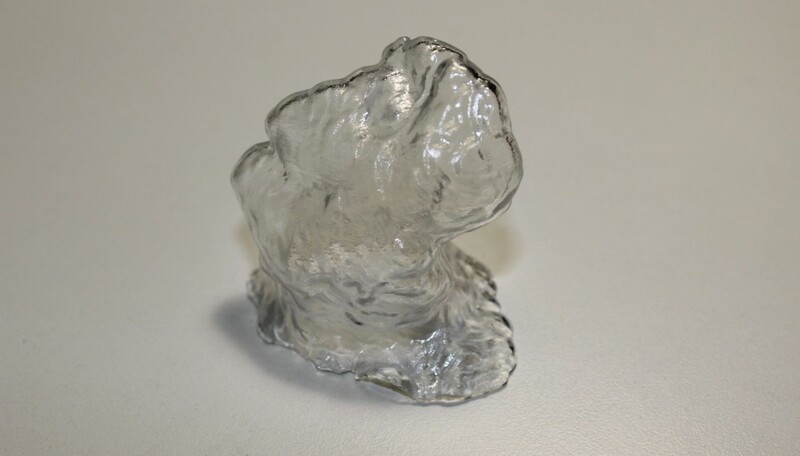 We transform medical images (MRI & CT) in a 3D printed object to hold in your hands! To assist surgeons in the planning and the performance of the surgery, and to facilitate the communication with the patient. … but it’s possibile to reproduce every human organ! We create three-dimensional models of the anatomy of the individual patient, highlighting all surgically relevant structures. Through the combination of engineering and medical skills, we have the ability to provide a truly integrated service tool for surgical planning. PolyJet printer with photopolymer resins crosslinking with UV light. It offers the possibility to use different colors and materials, also deformable and transparent ones. Very precise, able to achieve the smallest details of 20 microns. Particularly suitable to reproduce anatomical models of the abdominal cavity. Printer with photopolymer resins crosslinking with UV laser light. It allows you to create transparent models, also deformable ones. Great detail resolution. 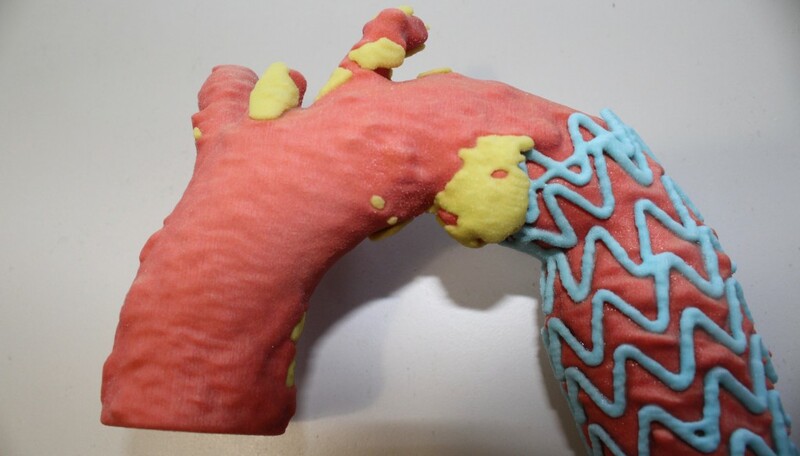 Particularly suitable to reproduce vascular models. Plaster printer, which offers the possibility to print patterns with a color resolution of over 2.6 million colors. Low production times and costs. 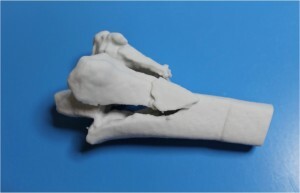 Particularly suitable for reproducing models of bone structures. 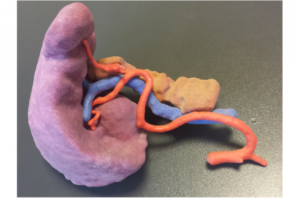 At Policlinico San Matteo, our 3D printed models are now used for surgical planning in 50% of cases of pancreatic surgery and in 100% of the spleen and kidney surgery. 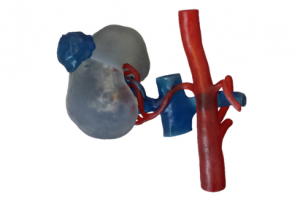 Our experience currently includes more than 40 cases, including models for the spleen resection, resection of the tumor of the kidney, spleen and pancreas, splenic aneurysm artery bypass and donation from a living kidney. 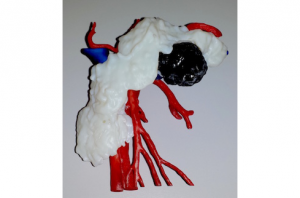 3D printed models are particularly useful during surgery, especially in robotic and laparoscopic surgery, where it is more difficult to have a complete overview of the surrounding anatomical structures. In otolaryngology and maxillofacial fields, our case studies mainly concern 3D models of temporal bone and jaw, used to plan surgeries that involve the facial bones. Temporal bone models are used by the surgeon to plan the placement of hearing aids and prosthesis. 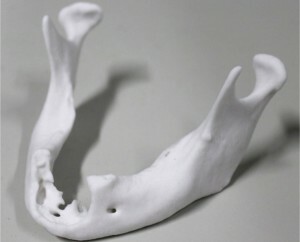 Mandibular models are useful for surgical planning that involves both the demolishing and the reconstructive phase, following removal of tumors in the jaw area. The cases discussed in this medical field include both traumatic lesions of various skeletal sites, whether the cancerous ones. Examples include pelvis or heel fractures and trauma to the spine. 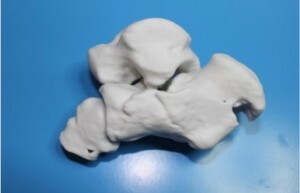 The traumatic injuries require great timeliness of realization, which are able to satisfy even delivering the 3D printed model within 12 hours, depending on the bone district. 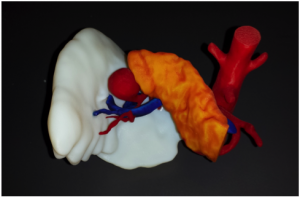 Aneurysm and aortic dissection are just two examples of diseases in which 3D printing helps concretely the vascular surgeon during the surgical planning. 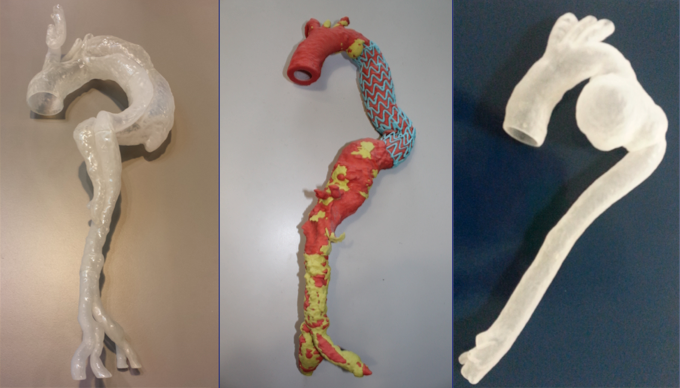 Our 3D printed models have also been widely used to evaluate the placement of vascular endoprosthesis, influencing the choice of the type and geometry of the most appropriate prosthesis for the specific clinical case. Thanks to its consolidated experience, the 3DMED Laboratory provides consumers with customized consultancy. For more information please contact 3dunipv@gmail.com.